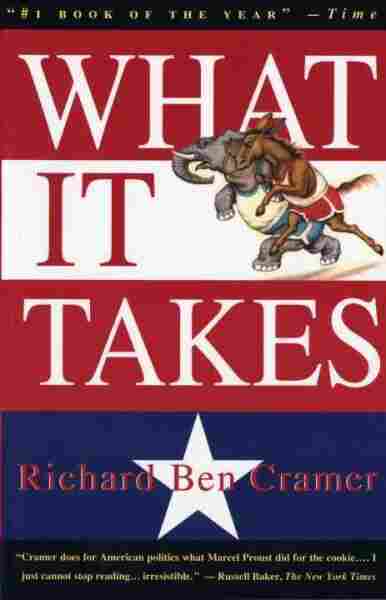 Book Review: 'What It Takes,' by Richard Ben Cramer | The midterm elections are less than two weeks away. Writer Michael Schaub recommends a book that explores what it's like to run for office and live through all the dramatic ups and downs. In less than two weeks, Americans will go to the polls to vote in the midterm elections. At least, some of them will — about 40% of eligible voters, if past elections are any indication. This year's races have already made stars — some rising, some falling — out of Americans hoping to represent their states and districts. Some, like Kansas Senate hopeful Greg Orman and Georgia governor candidate Jason Carter, may pull off surprising victories. Others, like Wendy Davis in the Texas governor race have seen their once bright lights fade. Even in its best moments, running for office is a roller coaster. Who are these people who are willing to put themselves and their families through constant scrutiny by the press, blistering attacks from their opponents, and hateful comments from Internet trolls? There's no easy answer to that question, but in his book What It Takes, the late Richard Ben Cramer came closer to finding out than just about anybody before or since. Cramer followed the Republican and Democratic candidates for the presidency in 1988, and chronicled what it was like for politicians to run the cruel and unforgiving gauntlet that is the American election system. Cramer writes, "I wanted to know enough about these people to see ... once they decided to run, and marched (or slid, or flung themselves headlong) into this semi-rational, all-consuming quest ... what happened to those lives ... to the lives they shared? What happened to their idea of themselves?" Calling What It Takes exhaustive would be a massive understatement. The book is over 1,000 pages long, and Cramer takes a hard look at what made these presidential hopefuls tick. Although the election was 26 years ago, there are, of course, familiar faces. There's George H. W. Bush, whose grandson George P. Bush is in the running for Texas Land Commissioner this November. And there's Joe Biden, just as passionate and glad-handing in 1988 as he is today. Cramer, who died last year, was more of a gonzo reporter than a Beltway pundit, and his writing style had echoes of Tom Wolfe and Hunter S. Thompson. That's part of what makes What It Takes so illuminating — he focused on the people behind the public personas. There's Gary Hart and his wife, Lee, facing a pack of reporters and photographers obsessed with Hart's relationship with the model Donna Rice. "As Hart moved, the pack moved, backward, blindly, crushing whatever was in its path. There was kid three or four years old who was getting trampled. Hart was furious. He'd always hated those gang-bang photo-blitzkriegs ... but now he was powerless." There's George H. W. Bush, caught on an open microphone after a fight with Dan Rather, making use of a few choice profanities . "Bush was like a warrior with his foot on his enemy's neck, whooping to the heavens. ... Bush apologized for his language, insisted he never would have taken the Lord's name in vain if he'd known people could hear him. (As if the commandment read: Thou Shalt Check Thy Mike.)" What he found wasn't always pretty — in fact it seldom was — and that's why Cramer's book is possibly the best one ever written about an American election. It takes a special kind of person to run for office — you've got to be tenacious, focused, and maybe even a little crazy. We might never find out why the men and women running this year chose to enter the cutthroat world of politics. But in a few days, we'll find out which ones couldn't manage to weather the political storms, and which ones had what it takes.